Crawlspace is very proud to announce its first Crawlspace Presents show at the Gasometer Hotel in Melbourne this August 3. We’ll be hosting the album launches for Love Chants’ 12 inch debut on Quemada Records (reviewed here) and the imminent LP reissue of Wonderfuls’ 2012 CD-R Salty Town (Wonderfuls interviewed here). 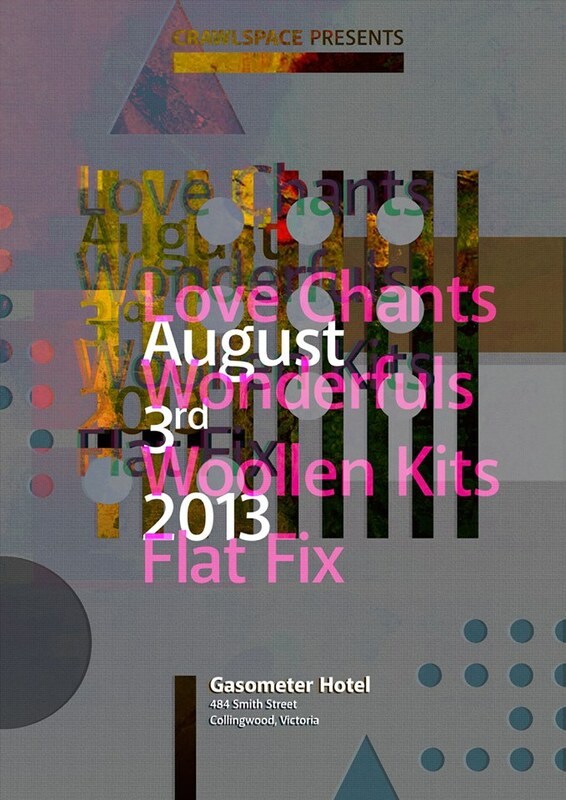 Joining Love Chants and Wonderfuls will be Melbourne’s finest pop group Woollen Kits, marking one of their first live appearances in yonks, as well as Flat Fix. Say you’re going to the event on Facebook if you want. Crawlspace Magazine will present four of Australia’s finest at Melbourne’s Gasometer Hotel on August 3, 2013. Brisbane’s WONDERFULS released Salty Town in 2012, a collection of straightforward and bleakly impressionistic songs borne of small town addiction and mental illness. Salty Town is one of the most unrelentingly bleak, darkly funny and transfixing records of the modern age. The duo’s performance will celebrate the LP reissue with copies available at the show. Rare opportunity. WOOLLEN KITS need no introduction: the Melbourne trio released two LPs via RIP Society in 2012. Songs about girls and other important issues. One of the best pop groups going around. FLAT FIX is a duo featuring Nick Senger (Castings, Alzheimer Blanks) and Cooper Bowman (RSI, Altered States Tapes). Together they produce strange electronic music using analog hardware. No woosy Brian Eno cliches, no retro house. Strange and transporting.